No. 895 is a 1000°F (538°C), top loading oven from Grieve, currently used for curing composite materials in large molds at the customer’s facility. 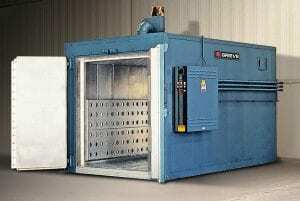 Workspace dimensions of this oven measure 168” W x 48” D x 48” H. 120 KW are installed in lncoloy sheathed tubular heating elements, while a 12,500 CFM, 10-HP recirculating blower provides horizontal airflow. 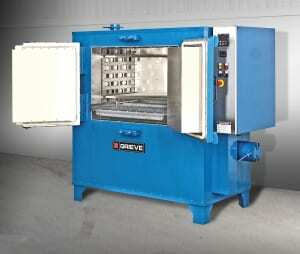 This Grieve top-loading oven features 8” thick insulated walls comprising 2” of 1900°F block and 6” of 10 lb./cf density rockwool. Other features include aluminized steel exterior, Type 304, 2B finish stainless steel interior, reinforced ¼” steel plate top, air-operated rear hinged door and wear bars at sides of workspace. Floor of workspace is reinforced for 4000 lbs. loading at removable stainless steel subway grates. Oven also features 325 CFM powered forced exhauster and access ports to allow monitoring of mold during injection. Controls on No. 895 include a digital programming temperature controller, manual reset excess temperature controller with separate contactors, recirculating blower airflow safety switch and SCR power controller. No. 865 is a 750°F (399°C), three-zone conveyor oven from Grieve, currently used for curing coatings at the customer’s test facility. Workspace dimensions of this oven measure 30” W x 18’ D x 15” H. 90KW (30 KW per zone) are installed in Incoloy sheathed tubular heating elements, while three 1500 CFM, 1-1/2 HP recirculating blowers provide vertical downward airflow to the workload. This Grieve conveyor oven has a 4’ long open belt loading zone and 4’ long open unloading zone. Features include three 6’ long insulated heat zones with independent recirculated airflow and temperature control, 6” insulated walls and aluminized steel exterior. Type 304, 2B finish stainless steel interior with continuously backwelded seams. Additional features include 24” wide, 1” x 1” 304 stainless steel flat wire conveyor belt with ½ HP motor drive, variable from 0.1 to 2 feet per minute. The oven is sectioned into five pieces for shipping. The oven has safety equipment for handling flammable solvents, including explosion venting door hardware. Controls on the No. 865 include digital indicating temperature controllers and a 3-pen circular chart recorder. 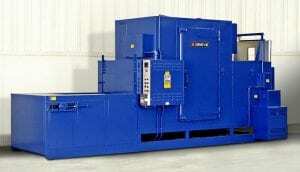 For more information, please contact: THE GRIEVE CORPORATION, 500 Hart Road, Round Lake, Illinois 60073-2835 USA. 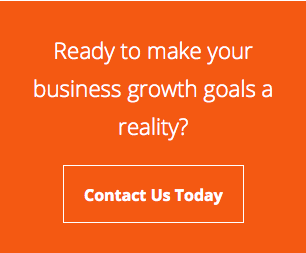 Phone: (847) 546-8225. Fax: (847) 546-9210. Web: www.grievecorp.com. Email: sales@grievecorp.com. Attention: Frank Calabrese. No. 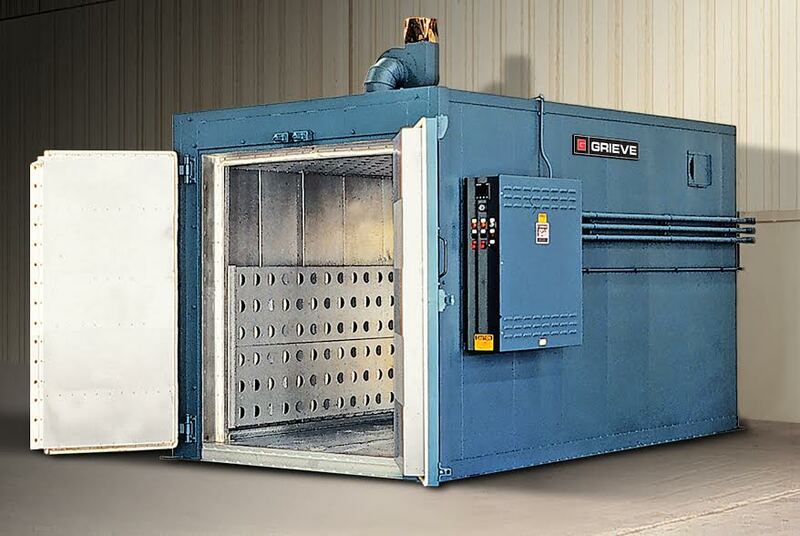 852 is an 850°F (454°C), high temperature walk-in oven from Grieve, currently used for heat treating and baking varnish at the customer’s facility. Workspace dimensions of this oven measure 60” W x 96” D x 72” H. 120 KW are installed in Incoloy-sheathed tubular heating elements, while a 7800 CFM, 5-HP recirculating blower provides combination airflow to the workload. This Grieve oven has 8” insulated walls and a 4” insulated floor. Additional features include an aluminized steel interior and exterior and safety equipment for handling flammable solvents, including explosion venting door hardware. Controls on the No. 852 include a digital indicating temperature controller & manual reset excess temperature controller with separate contactors. No. 897 is a 350°F (177°C), belt conveyor oven from Grieve, currently used for preheating trays of parts prior to potting operations at the customer’s facility. Workspace dimensions of this oven measure 36” W x 120” D x 15” H. 30 KW are installed in Incoloy-sheathed tubular heating elements, while a 6000 CFM, 5-HP recirculating blower provides vertical downward airflow to the workload. This Grieve belt conveyor oven has a 48” long open belt loading zone and a 10’ long insulated heat zone with recirculated airflow. Features include a 30” wide, 1” x1” high carbon steel flat wire conveyor belt with 1/4-HP motor drive, variable from 1.4 to 27 inches per minute. Additional features include 4” insulated walls, aluminized steel interior and exterior and a manually operated vertical lift door at unload with viewing window. The oven also has a photo cell to automatically stop the belt when parts reach the unload position. Controls on the No. 897 include a digital indicating temperature controller, manual reset excess temperature controller with separate contactors, recirculating blower airflow safety switch and SCR power controller. No. 1038 is a 500°F (260°C), inert atmosphere walk-in oven from Grieve, currently used for annealing polyurethane tubing at the customer’s facility. Workspace dimensions of this oven measure 60” W x 72” D x 84” H. 40 KW are installed in Incoloy-sheathed tubular heating elements, while a 4200 CFM, 3-HP recirculating blower provides vertical downward airflow to the workload. 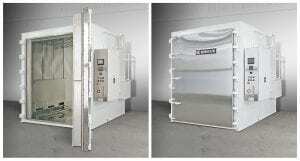 This Grieve walk-in oven has 6” insulated walls and an aluminized steel exterior with white epoxy paint. Type 304, 2B finish stainless steel interior with continuously backwelded seams and inert atmosphere construction are also onboard, including a pressure regulator, flow meter, pressure gauge, inner oven walls sealing directly against ½” thick silicone rubber door seal, blower shaft seal, positive latching door hardware, adjustable offset door hinges, outlet with pressure relief, interior seams welded gas-tight and all wall penetrations fitted with compression fittings. The oven has a 4” insulated floor with truck wheel guide tracks mounted on top of the floor. Controls on the No. 1038 include a digital programming temperature controller plus a paperless event recorder. No. 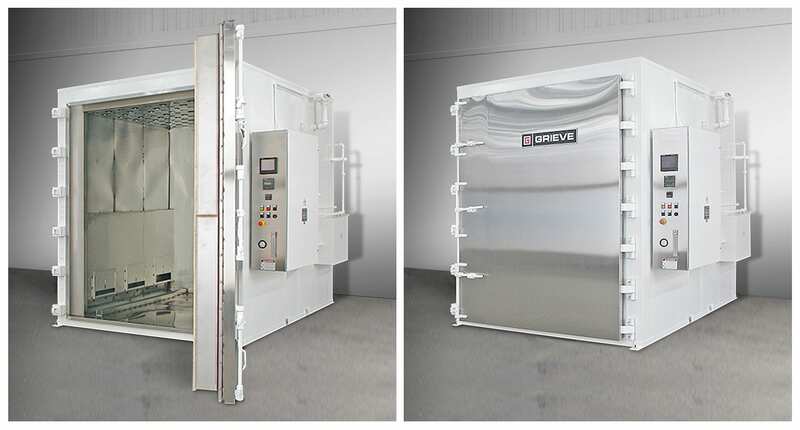 1035 is a 550°F (288°C), cabinet oven from Grieve, currently used for heating heavy steel housing at the customer’s facility. Workspace dimensions of this oven measure 38” W x 20” D x 26” H. 8 KW are installed in lncoloy sheathed tubular heating elements, while a 600 CFM, ½ HP recirculating blower provides universal front to rear airflow. This Grieve cabinet oven has 6” insulated walls and an aluminized steel exterior. Features include a Type 304 stainless steel, 2B finish interior and one 38” wide x 20” long roller shelf at bottom of workspace rated for 200 lbs. loading. Controls on the No. 1035 include a digital indicating temperature controller, a manual reset excess temperature controller with separate contactors, plus a recirculating blower airflow safety switch. No. 870 is a 500°F (260°C), inert atmosphere oven from Grieve, currently used for aging rubber parts at the customer’s facility. Workspace dimensions of this oven measure 36” W x 60” D x 36” H. 12 KW are installed in lncoloy sheathed tubular heating elements, while a 600 CFM, ½ HP recirculating blower provides universal airflow to the workload. 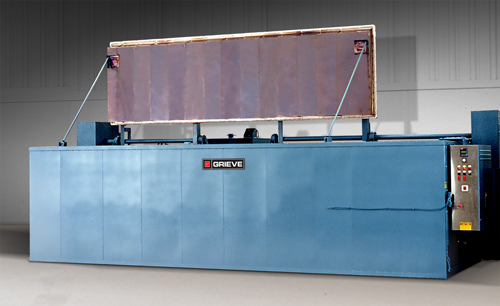 This Grieve inert atmosphere oven has 4” insulated walls, an aluminized steel exterior and Type 430 stainless steel interior. The oven features inert atmosphere construction, including a pressure regulator, flow meter, pressure gauge, inner oven walls sealing directly against ½” thick silicone rubber door seal, air jacket on the inner oven for cooling, blower shaft seal, positive latching door hardware, adjustable offset door hinges, outlet with pressure relief, interior seams welded gas-tight and all wall penetrations fitted with compression fittings. Also onboard is a 650 CFM blower with 2-position motorized dampers to pull air through the air jacket on the inner oven for cooling. Controls on No. 870 include a recording and programming temperature controller. No. 812 is a 650°F (343°C), high temperature top-loading oven from Grieve, currently used for heating stainless steel prior to welding at the customer’s facility. Workspace dimensions of this oven measure 72” W x 36” D x 36” H. 40 kW installed in Incoloy-sheathed tubular elements heat the workspace, while a 3300 CFM, 2 HP recirculating blower provides horizontal airflow to the workload. This Grieve top-loading oven features 5” insulated walls, aluminized steel interior and exterior, plus a reinforced ¼” steel plate top. Features also include an air-operated rear hinged door and wear bars at the sides of the workspace. The floor of the workspace is reinforced for 3000 lb. loading at removable subway grate. Controls on No. 812 include a digital indicating temperature controller, manual reset excess temperature controller with separate heating element control contactors and recirculating blower airflow safety switch.